Jeff Hanneman, one of the founding guitarists of the pioneering thrash metal band Slayer, died today in Southern California of liver failure. He was 49. 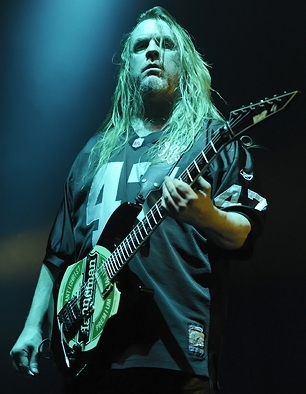 Hanneman had been on hiatus from Slayer since early 2011, when he contracted necrotizing fasciitis, a flesh-eating disease that doctors believed might have been caused by a spider bite. Hanneman almost lost his arm, and was briefly placed in a medically-induced coma. After a series of skin grafts, he had been working on his physical rehabilitation, including playing guitar; the door had been left open for his return to Slayer upon recovery. Hanneman performed on every Slayer release to date, and wrote many of the band's career-defining songs, including "Angel of Death," "South of Heaven," "Raining Blood" and "War Ensemble." Hanneman and Kerry King perfected a fiery twin-lead guitar style that propelled Slayer to the forefront of the thrash metal movement of the early 1980s, where they were crowned as one of the genre's "Big Four," along with Metallica, Megadeth and Anthrax. Twin-guitar soloing was a hallmark of thrash metal from the start, but the particular brand of spiraling chaos that came from Hanneman and King's swapped leads created a more apocalyptic, uncontrollable atmosphere that helped set the band apart from its peers, who often opted for a more melodic approach. The band took pride in the distinction, with King telling Rolling Stone in 2009, "When we come on, it sounds like the world's going to end." Hanneman grew up in a military family, and his fascination with warfare and violence came through in Slayer's artwork and lyrics, many of which he also wrote. His most notorious lyrics, from 1986's "Angel of Death," matter-of-factly describe the atrocities committed by Nazi doctor Josef Mengele at Auschwitz. Many mistook this interest in one of history's darkest chapters for endorsement or sympathy with its perpetrators – something the band has worked to rebut ever since. As Slayer went on, Hanneman gradually reduced his lyrical contributions while continuing to write a significant portion of the music – including all but one of the tracks on 1998's Diabolus in Musica, as well as the song "Disciple" from 2001's God Hates Us All, which has become the band's standard set-opener in concert since then. He developed an onstage style that became well-known among metal fans, as he was often clad in Oakland Raiders jerseys and camouflage pants or shorts, his hands blurred from ferocious picking as he hunched over a guitar emblazoned with a giant Heineken logo, the brand name replaced by "Hanneman." Slayer formed in Huntington Beach, California, in 1982, and released their debut, Show No Mercy, the following year. Hanneman wrote or co-wrote the majority of the material, including "Die by the Sword" and "Black Magic," which are still concert staples. The band released Reign in Blood in 1986, a Rick Rubin-produced, 29-minute concentrated blast that, for many, remains the be-all, end-all of thrash metal. Two of Hanneman's compositions, "Angel of Death" and "Raining Blood," book-end the album. As the band developed into the 1990s, albums like Seasons in the Abyss and South of Heaven slowed down the tempos, opting instead to focus on eerie atmospheres and inspiring dread, while still displaying some of the ferocity of the band's earlier material. More recent efforts, including 2006's Christ Illusion and 2009's World Painted Blood, renewed the band's fascination with speed. When Hanneman was forced to go on hiatus for health reasons two years ago, Exodus guitarist and fellow thrash pioneer Gary Holt took his place. Hanneman's final appearance with Slayer was a surprise cameo during the encore of the Big Four Festival in Indio, California, on April 23rd, 2011. He performed two of his best-known songs, "South of Heaven" and "Angel of Death."